I had Indian food a few times last week as we had visitors from Europe who don't eat Indian food very often. Half (if not more) of Dubai's population is Indian, so you get delicious and authentic Indian food at almost every corner. I love it for its spices, that doesn't just make a dish spicy hot, but first and foremost flavorful. I have had mustard seeds in my pantry for quite some time, but didn't really know what to do with them. Mr. Google helped out, and here is the result: Cauliflower with mustard seeds. Simple as that. I cooked this dish twice today. The first batch was eaten straight out of the pan and didn't have a chance to get photographed. This is a dish that even cauliflower haters will eat. 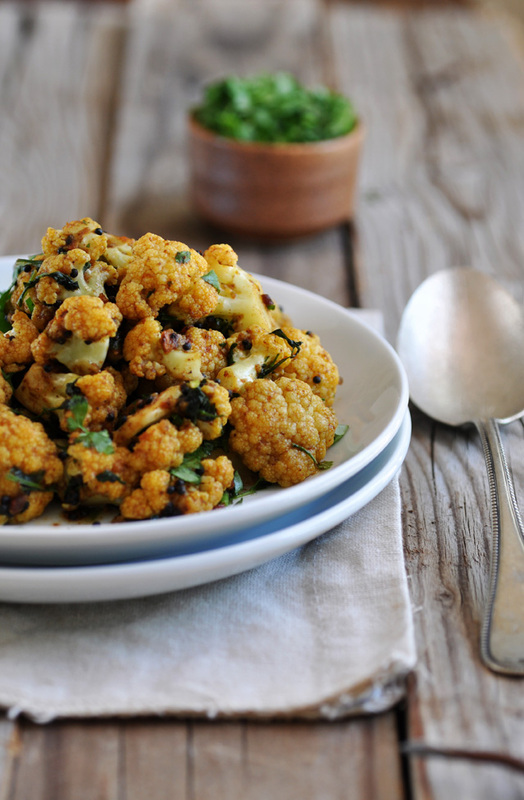 The light taste of the cauliflower is combined with the most amazing spice mix, combining cumin, turmeric, chili and mustard seeds. It's not overly spicy hot, but definitely has the zing that you would expect from an Indian dish. It's exactly this full round flavor that I so like about Indian dishes. Serve this cauliflower dish on top of brown rice, and you'll have a perfectly healthy and vegan dish that's light and hearty at the same time. I guess this dish can even be done with other vegetables too: I can imagine green beans or Brussels sprouts in here. Bon appetit! Combine mustard seeds and fenugreek seeds in a small bowl. Set aside. In another small bowl combine cumin, turmeric, chili and salt. Keep all spices near the stove. Heat oil in a deep pan until very hot. Add all seeds. When mustard seeds turn grey, reduce heat to medium and stir in ground spices. Cook for a few seconds, then stir in minced garlic and chopped tomatoes. Cook for about 5 minutes. Stir occasionally. Add cauliflower florets and stir so it becomes coated with the spice mix. Stir fry for a few minutes. Add 1/4 cup of water and 1/2 cup of chopped cilantro/parsley leaves. Turn heat on high, cover pan with a lid and cook until cauliflower is tender, about 3-4 minutes. Add more water, if needed. Add lemon juice and season with salt to taste. Garnish with remaining cilantro/parsley. Serve immediately.